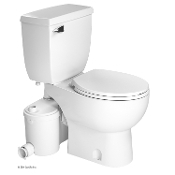 The Sanibest Pro is the best upflush system available an excellent choice for either commercial or residential settings. The Sanibest Pro is a 1 HP pump system used to install a complete bathroom up to 25 feet below the sewer line, or even up to 150 feet away from a soil stack. It incorporates a grinder system which is ideal for uncontrolled environments in both residential and commercial applications (ie. rental unit, offices, warehouses, etc). The Sanibest Pro is designed to handle sanitary products that may have been flushed down the toilet; such may consist of condoms, sanitary napkins, q-tips, dental floss, etc. Note: In commercial installations, plumbing codes require an elongated bowl to be installed with this system.